If by chance you've been checking out my Instagram, you might be aware that we are expecting our third baby girl any day now. To be exact - our due date is today! So right now, we are just in waiting mode. Or maybe you saw this post way back when where we told our other two girls they were getting another sister. If not, now you know. This is the reason why this poor little blog of mine hasn't seen much action over the last 9 months. But now that I am here just waiting for #3 to arrive, I have a little time to talk about one of my favorite times of the year. 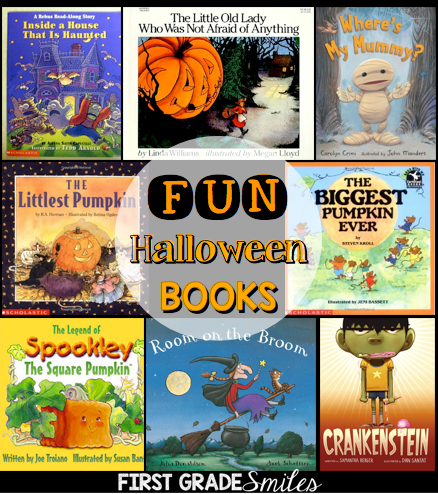 If I were in school right now (my last day was Friday) I would be taking out some of my favorite Halloween books. I might also be getting my favorite bulletin board ready. And I would most definitely be getting some of the following activities out and ready to be copied for these next couple weeks. I wanted to share them with you because even though these pictures are from last year, I never got a chance to properly share them amidst the Halloween chaos. Plus, I'm a little sad that I won't be there this year for all the Halloween fun they will be having. I'm sure my sub will be lovin' it all because I have a great group of kids this year that will eat. this. up! So here are some of the activities (mostly literacy) that I love to do with my kids this time of year. First up is this little rhyming story that I LOVE to read with my students. I was lucky enough to have Nikki from Melonheadz clipart make me these little witches and the other clipart to go with my story. We read this book together and then the students complete some activities afterwards like some comprehension activities and also a pocket chart activity. As I mentioned earlier, I love to take out my Halloween books each year. One of my favorites, and probably most teachers' favorites, is The Little Old Lady Who Was Not Afraid of Anything. I love using the book on tape (yes I said tape -- I'm not throwing away those cassettes until they do not work anymore). This one is a fun one to listen to with the background music and noises. 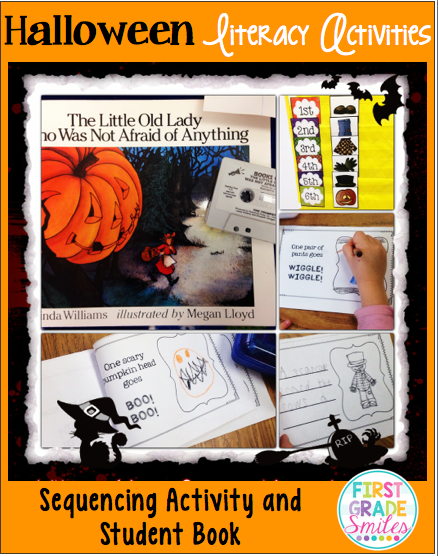 Then students complete this sequencing activity and put together this mini-book. 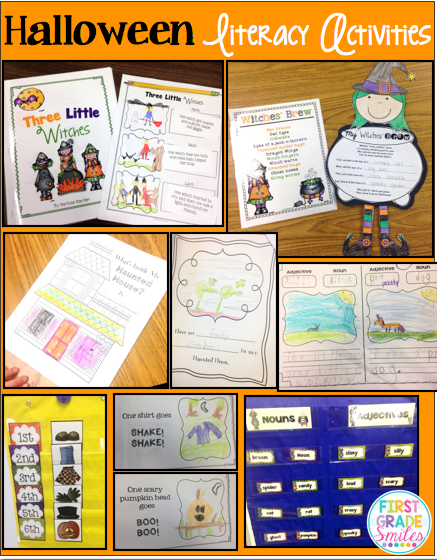 Halloween is also a great time to learn about parts of speech. 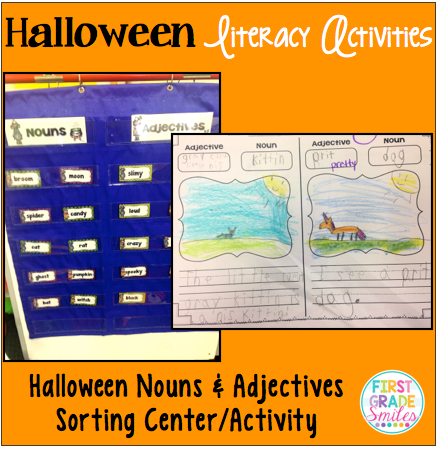 There are so many fun nouns and adjectives that fit with Halloween like: spooky spiders, creepy ghosts, wacky witches, and slimy skeletons. 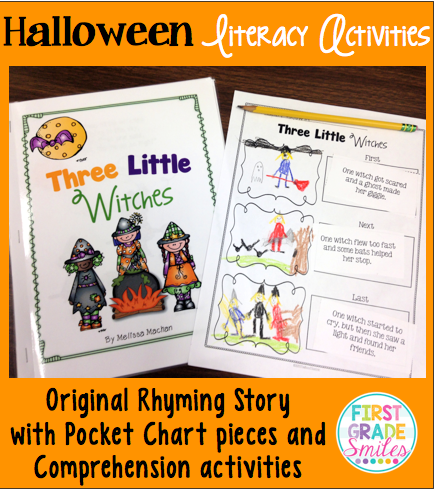 There are tons of great activities to go with teaching Halloween parts of speech. I like to sort them and practice using them first. 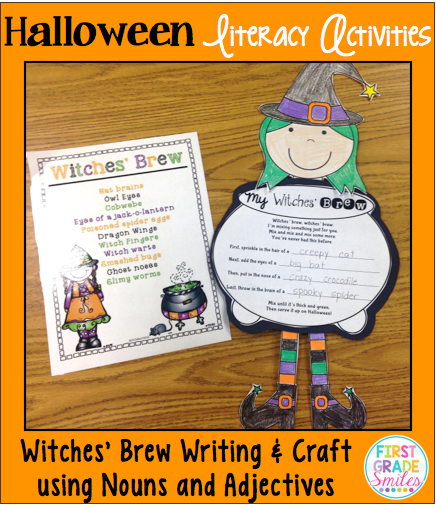 Then we turn them into something adorable like this Witches' Brew writing and craft. OR this Haunted House book. 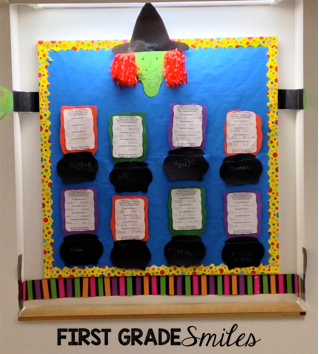 I also have another quick activity in my store that uses nouns, verbs, and adjectives called: Halloween Fill-in-the-Blank Poetry. Did I mention I love to do as many Halloween read alouds as I can??? 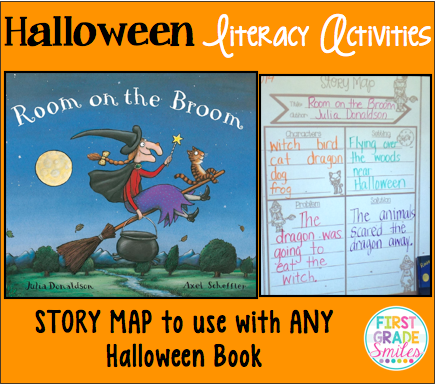 So an easy activity to do with a read aloud is a story map. 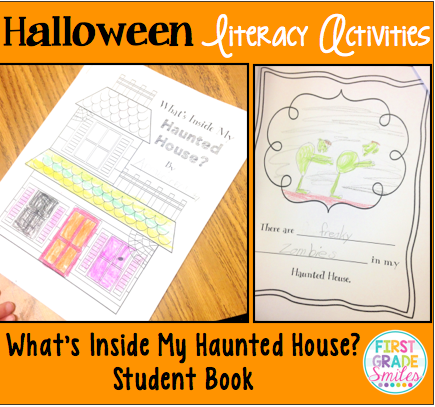 Here is another book activity that is fun to do. 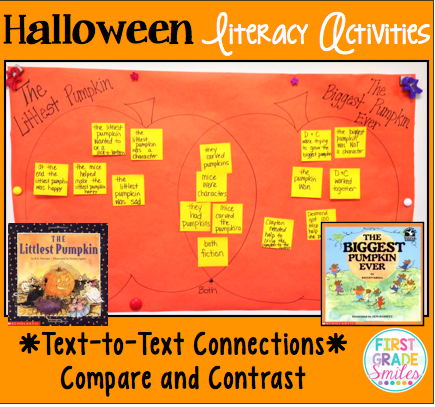 These two books are perfect for a compare/contrast lesson and finding text-to-text connections. Now after all this literacy fun, it will be time for a snack. 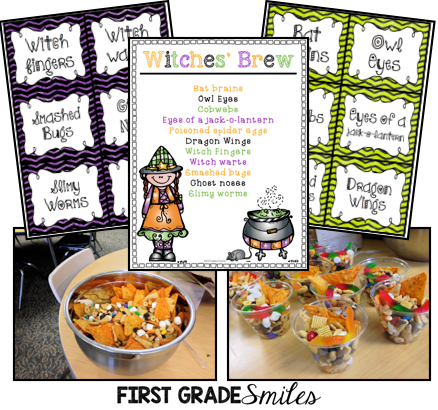 I love making this Witches' Brew with the kids. I use the labels on paper lunch bags and put the ingredients inside so they can't see them. I add them one at a time --- making a big deal about what it is. "Time to add some witch warts --- now these are yummy! But not as good as these smashed bugs -- plus, they have protein!" You get the idea. I mix it all up in a large bowl and serve it in cups for the kids. Obviously they figure out that dragon wings are really Doritos and smashed bugs are raisins, but it's still fun. 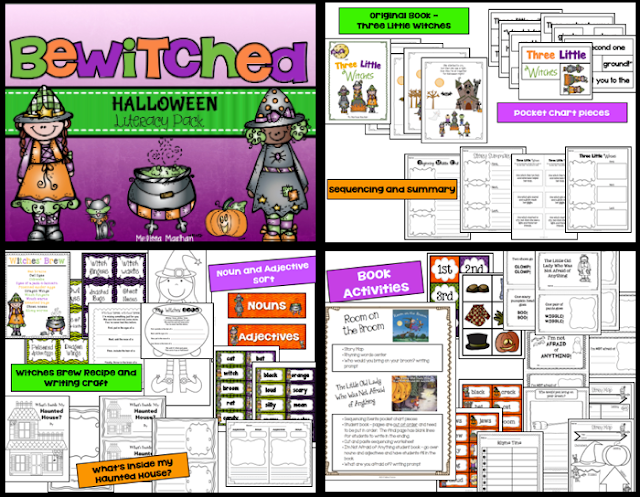 These activities can be found in my Bewitched: Halloween Literacy Pack. So although I won't be the one teaching these activities in my classroom this year, I can't wait to see the pictures and hear all about it from my sub. I will be home, being a mom! The best job in the world. I might be able to go in to school for my daughter's classroom Halloween party that I usually have to miss. Maybe I will bring in a snack. The two snacks below are suuuuper simple if you are looking for something to send in to your child's class. The bottom pictures are just mandarin oranges with a black sharpie. Sometimes it's nice to have something other than candy at a Halloween party. 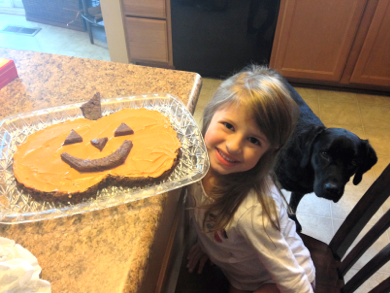 The Jack-o-Lantern is made out of a pan of brownies. 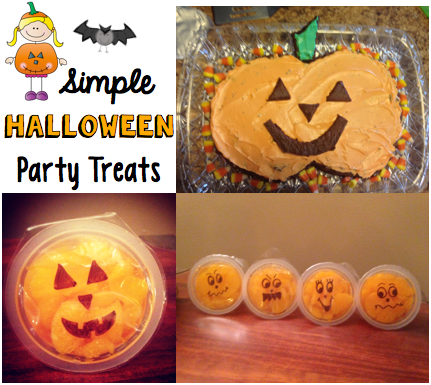 It was so simple to cut the outline of the pumpkin, frost it with orange icing, and then use the leftover brownie pieces for the face. My daughter loved it so much she has requested it again this year instead of a birthday cake for her end of October birthday. Even though this year will be a little different than it usually is for me, I am still so excited to have some Halloween fun! Happy Early Halloween to you!! !